Polar have been teasing us for ‘Shadowed By Vultures’ since the release of ‘Glass Cutter’ in October and ‘Mountain Throne’ earlier this week and it still isn’t enough. This early on it is clear that ‘Shadowed By Vultures’ is one of the best things to come from 2014 already, Polar are always reliable for epic pit inducing, crowd chanting tracks but this full length has taken it to the next level. 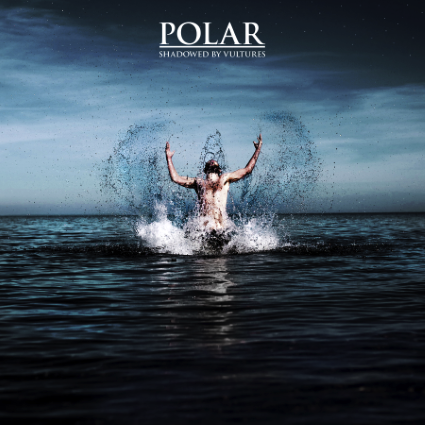 Polar have matured and developed bringing depth, musicianship and ingenuity to create a inspirational and remarkable album that will form an iconic place in their discography. ‘Shadowed By Vultures’ opens with ‘First Breath’ which immerses the listener in, calling them out with a dominating and prevalent riff heaving them to the forefront of the album. In 52 seconds we have already had all our attention drawn out by a tyrannical Polar calling card that preludes what is unleashed throughout the entire album. And they continue to dominate our ears with ‘Blood Lines’ pulling Woodford’s vocals forward in an anthemic chorus, his vocals are one of Polar’s unique points that through every rasp, growl and shout there is nothing but clarity, you can hear every word and shout it back. First single ‘Glass Cutter’ premiered on Radio 1 in October and still stands out as one of the most influential tracks from ‘Shadowed By Vultures’. The track ignites crowds and echoes out venues with ‘I am the water that fills your lungs’ and spurs images of people climbing over each other in frantic Polar induced fits. However, ‘Before The Storm’ then brings the full length to a hauntingly unexpected halt, the female vocals juxtaposing Woodford’s rawr into an eloquent and fragile track that delves deeper into anything we could have expected. A longing, fervent track that commands notice among the destructive album as we go into the second single ‘Mountain Throne’. Within days of the video being posted fans have begged for the lyrics so they can’t sing them back. As guitars rise up and haul us through every breaking breath of the track you can see why ‘Mountain Throne’ has swept up fans all over the internet sitting behind their screens desperate to shout ‘We are, we are condemned to be criminals!’. And Polar do not cease there as they rip into the neck breaking ‘Vipers’ which finds itself as another example of Polar’s outstanding song writing before title track ‘Shadowed By Vultures’ that never relents. The track falls on intricate, resilient and winding riffs that form around unrelenting percussion. As instruments rile up in pauses into incessant uproars before piano keys fall in and we seamlessly find ourselves in ‘Paradise’ . The articulate and delicate track forms the most beautiful breather in such a hefty album allowing a moment of recollection before ‘Create’. If you didn’t know ‘Create’ from their previous EP ‘Inspire Create Destroy’ then you don’t know what Polar excellence you have been missing. Although they have clearly developed from their previous work ‘Create’ still commands every second of savage attention it deserves. If Polar don’t have you chanting ‘Inspire! Create! Destroy!’ by the end of their set, you are definitely in the wrong place, or they have already broken you. As the album closes on ‘Our Legacy’ Polar unleash a rasping raw space before strings wind us into a frenzy that leaves us desperate to play the album again. Twangs and stomps winding down a diverse and prodigious album that will be splitting our headphones for years to come.